At first glance, this would seem a nonsensical thing to say. 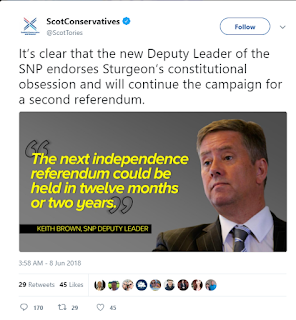 The Depute Leader of the SNP supports independence for Scotland? Definitely high on the 'D'uh' scale. If you think about it, though, this reveals a little more than they might have thought. Let's take the Labour party. Formed in the late 19th century as the Independent Labour Party, this had its origins in the growing Trade Union movement and had as its aim the representation of working class interests in Parliament. They formed their first government in 1924, and became the official opposition when not in government after that. Fast forward to today, and the Tory and Labour parties are almost indistinguishable apart from some tinkering round the edges. To all intents and purposes the Labour party has been absorbed into the Establishment and the threat they originally posed to the interests of the wealthy and property-owning classes has been essentially neutered. Evidently the Establishment thought that the strategy that had worked well for Labour would also work for the SNP. Give them some privileges, show them how things really work and they will soon be at the trough with the rest of them. The Establishment can relax once more, the threat to the their power neutered. The tweet above reveals, I think, a certain frustration that the strategy doesn't seem to be working. The SNP need to be very careful that they don't fall for the same tricks that the Labour party fell for and don't get too comfortable with their positions in Westminster and Holyrood. First and foremost the aim of the SNP is to obtain a return to independence for Scotland, and they need to keep their eyes on this prize and not get too comfortable with the trappings of power as currently constituted.